No matter how complex your campaign, it’s important to remember that there really are only four general variables that really matter when it comes to creating a response-generating campaign. Audience, Offer, Timing & Creative. Why Audience Trumps Everything Else. Many professionals tend to focus more of their attention, proportionally, on the creative side of a marketing campaign. And that’s expected — It’s fun, exciting and the tangible part of marketing. But consider that it is very hard to talk to someone when their head is turned away. Similarly, you can have the best looking creative with a super offer, but if you are not targeting the right audience, your effort is wasted. Try this exercise: close your eyes – wait – don’t close your eyes, keep reading. So squint your eyes as you picture a yummy cheeseburger. It’s the biggest, most luscious, bacon, onion and saucy cheeseburger…with juice dripping down the side, the cheese teasing out from over the patty. The crisp lettuce and fragrant and flavorful tomatoes offer the perfect crisp and fresh balance on a super fresh bun. Enticing, right? How can you go wrong with such an amazingly appetizing product and photography that is almost as good as smell-o-vision. So, if you saw this ad would you be hungry? Maybe. Now imagine you’re a vegetarian and go through the same exercise. Makes it a very different experience. Audience matters the most. Goldilocks — the first market intelligence professional. To begin with, be very very careful with your offers. Nurture them and treat them like children, ie, don’t let them out the door without extra security. What I mean by this is that too often, businesses become offer-happy. Offers are wonderful tools when used well. But be careful to run the numbers and be careful you are not training your customer to expect a deal all the time. A long time ago in a marketing agency far far away… I had a client who had a HOT offer in the market that was driving traffic through the door at an astounding rate. A hugely successful offer that blew the doors off of their projections. Yet they couldn’t figure out why their revenue was actually decreasing. As it turned out, because of the way the offer was structured, they were losing money on each and every one that was redeemed. So while the traffic was way up – revenue was negative for each offer walking in the door. Successful? Only if you are looking at response rate! But timing has more to do with being relevant than simply responsive. 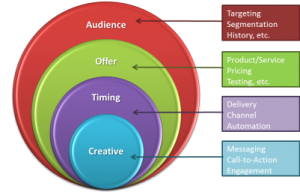 When will your offer be the most relevant to your audience. (Once again, Audience leads.) For example, say you have a product like Chili. Chili is great year-round, but the sales are higher in the winter. So when should you send your message about how great your Chili is – do you send it during your down times to encourage people to eat hot Chili in the blazing heat of summer? Or in the deep of winter to get as much of the Chili pie as possible? This is another topic altogether, but trying to encourage your customers to change their behavior is extremely difficult. [I’ll post about customer behavior separately.] So you want to ride the wave and get to them when the getting’s good! In many ways, the creative can be the most important part of your campaign because it is the experience of how all of the above come together. If you know your audience, have a balanced offer and know when the best time to send it is, the creative needs to pull it all together and deliver it in a way that is understandable within seven tenths of a second. That’s all. Simple, right? The key to strong creative is simplicity. Stay on your primary message and deliver it succinctly with a strong call to action. C/ have a decent message but have a layout that really doesn’t deliver. While this is only a brief touch on these topics, I hope this has helped to get you started thinking about the basic variables in your marketing campaign executions.